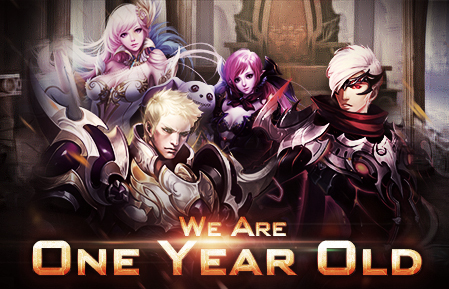 Knight\'s Fable is one year old(soon)! We have many things this year with Knight\'s Fable. Knight\'s Fable is grown up with more functions, events, heroes, beasts, mounts, Goddess and many other things, among which, the most important thing is, Your Support. That\'s all for my (terrible) poet time. Share with us your most unforgettable experience during this year in Knight\'s Fable. no matter how much you have played it. I sure am not a poet and First Post Yay!!!! It has been a very interesting experience since I have started playing this game. ;I have spent more money than I ever though I would ever spend on one game. ;It has been fun and will be around to see what happens over the next year. Started to play only on october. Just discovered what fun Knights Fable is so here is to many years of being around. I guess my most unforgettable experience in Knight\'s Fable was in the first four weeks in my server wherein we got to do Alliance War and 3-4 alliances got to compete against each other to occupy the 3star Fortress but as the game progress, players began to quit and no more fun in alliance war. Despite the bugs I have enjoyed the game very much! I don\'t like to think of the money I have spent but how many hobbies cost nothing. I plan to be around for some time and look forward to see what comes next! 2019-4-23 06:43 GMT+8 , Processed in 0.076258 second(s), 56 queries .